Have you ever resisted a stamp because you thought you did not need it or you didn't know what to do with it until you saw a card made from that very image? Of course, that changed immediately, when I received this adorable card from my friend Dotty. Why had I not thought of that? This stamp doesn't HAVE to be a baby image exclusively, LOL. 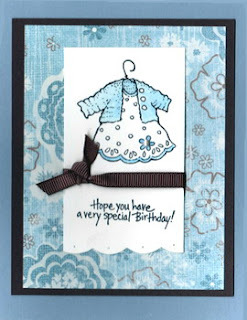 Oh, and Dotty, I really think your card is the cutest! That background paper is so perfect for the design! Isabelle, haven't you learned by now... resistance is futile! December 18, 2007 at 4:56 a.m. This is darling! I was looking at the hem of the dress and seeing a punch I have... Wait, I don't need this stamp because I got my Christmas present from my sister last night and she shopped at the Stampbuzz. Can't wait to ink up those boots! Merry Christmas and Happy New Year!! December 18, 2007 at 11:31 a.m.